The Falkenstein's castle is the most important castle of the Bitche's land. Its construction merges with thin stoned spur which is long 120 meters and high more than 20 meters. Built in the 12th century, on the Lutzelbourg's earls initiative, it has been then transferred to the Sarrewerden's earls which gave it in fief to the Falkenstein's family. As the whole area has to be used as most as possible, several Falkenstein's family leaved there. medioeval castles In 1564, the castle turned to Philip IVth, earl of Hanau-Lichtenberg. A few months later, the castle entirely burned out and will never be built again. A legend tells that he burned out for 5 days and 5 nights. For security reasons, access to the castle is strictly regulated. On the same crest, near the Falkenstein, one can see the Helfenstein's (which means : the stone which brings help) castle. In 1410, this castle forms a fief of the Lorraine's county with the villages of Butten, Kirspach and Birsbach. A few hundred meters from the Falkenstein, the Rothenbourg's castle shows only a few remnants. We ignore on which date it was built. In 1353, the castle is named as a part of the Bitche County. A few years after, as it became an hiding pace for thieves-knights, the Strasburg's militia devastated it. On the 16th century, one describes it as an "old small ruined castle". It just stays so. 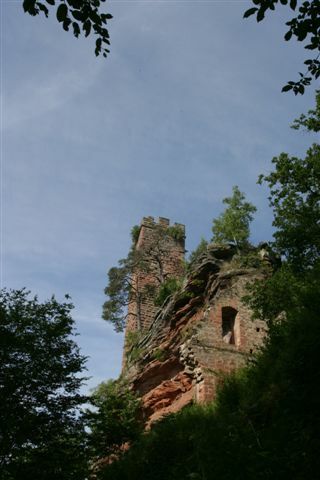 Emerging from the wood, the Waldeck's castle donjon is an integral part of the Hanau's pond site. The castle, which was built on a stoned spur at the end of the 13th century, often changed owners. Originally, the castle was owned by the Lichtenberg's sires, in 1395, he was transferred to the Deux-Ponts-Bitche's earls up to 1570, year of the last descending's death. Waldeck's castle A few years after, during the thirty years' war, the castle was broked up by the "Maréchal de France" 's troups and will never be built again. For security reasons, access to the castle is strictly regulated. 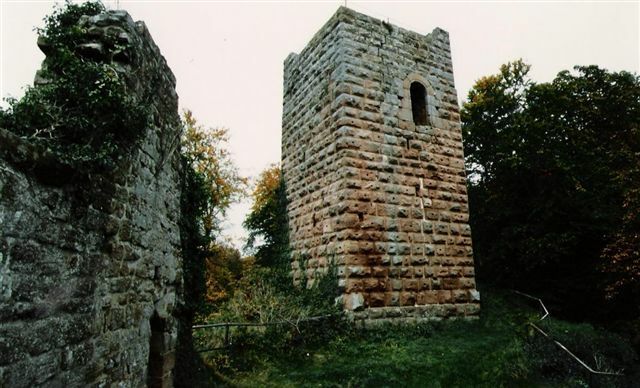 The "Grand Arnsbourg" castle's ruins, located between Philippsbourg and Niederbronn-lès-bains are a part of a castle built in the middle of the 12th century. The aim of the castle's construction was the observation of the Zinsel valley which leads to Bitche. In 1229, Louis of Arnsbourg was the first owner of the castle ; in 1332, it was transferred to the Lichtenberg's sires until the family's extinction. castle's ruins Then, it became the property of the Deux-Ponts-Bitche's earls, before it had been partially destroyed in 1525, during the Peasants' war. For security reasons, access to the castle is strictly regulate. The Philippsbourg's fortificated rock, which dominates the village, was, during the middle-ages, the Falkensteinerbach valley's observation place. Nowadays, it remains, only a few stoned fittings, which is probably a real conjecture that a light construction, may be an half-timbered house, was built on the rock. Unfortunately, one can found no mention of this fortification, but it seems that the rock was named Philippsfels or Philip IVth's rock after it had been fitted, as a recording of the fortifications' builder, Philip IVth of Hanau-Lichtenberg.